Description: I title this shot of this eastbound freight this way because I was listening to that great oldie "Midnight Train To Georgia" when it appeared! Yet another glut of power moving through the western suburbs, six units worth. Description: The impressive Memorial Day lashup I caught as viewed in a going away view. Description: For a minute or two this train was stopped by red signals facing west until the signal on the main track facing east was turned on to red, allowing this eastbound to continue its last lap into Minneapolis. Some of the units doubtless were along for the ride not providing power, as in at least the case of the MP15. Description: Whoever did this graffiti had the right idea when they put it on this bridge! BNSF 1804 is seen on the right shoving another cut of cars into the yard. Description: One of the pullout engines move light around 35th Ave on a nice fall day. Description: BNSF 1804 drills cars at Northtown yard. 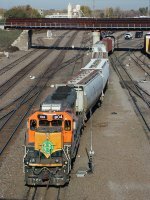 Description: Another Northtown-based SD40-2--its paint quite GN-esque--sits on the old NP passenger main lashed up to a cut of hopper cars on a remarkably spring fever-worthy afternoon in early March.